Barcelona reportedly won’t actively look to sell Samuel Umtiti, but an exit from the Nou Camp this summer hasn’t been entirely ruled out. The 25-year-old has been plagued by a knee injury this season, and that in turn has limited him to just 11 appearances in all competitions. Clement Lenglet has begun to impress after arriving from Sevilla last summer, and he could well keep his compatriot out of the starting line-up between now and the end of the season. With Sport also suggesting that Barcelona are expected to wrap up a deal to sign Matthijs de Ligt, it would appear as though they could have significant quality and depth in a key area of the squad with the competition perhaps forcing Umtiti further down the pecking order. 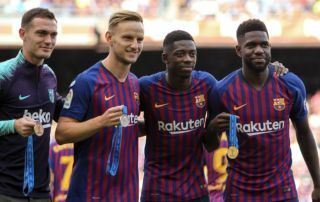 However, in order to balance the books and to maintain the balance within the squad which has led Barcelona to still being in contention for a possible treble this season, that could also lead to an exit. According to Sport, the Catalan giants have had their troubles with their defensive ace in recent times over his contract and injury and now value Umtiti at over €70m. However, they will not actively place him on the market and sell this summer, but instead should an offer come in that satisfies their demands, it could ultimately lead to a deal being done. It seems like a dangerous move from Barcelona if it does go through, as Umtiti has established himself as one of the top centre-halves in Europe, and so it would surely be a major blow if they do end up selling him. As noted by the Metro, Man Utd have been paired with an interest in the World Cup winner, and so this latest update will surely be of interest to them as Ole Gunnar Solskjaer looks to shore up his backline at Old Trafford. Umtiti would be a quality addition for any side, but again, regardless of whether or not he’s currently not a guaranteed starter, he has the quality, experience and pedigree to remain a major success at Barcelona for years to come.